Regarded as the “founder of Indiology,” Al-Biruni advanced sciences in the Islamic world with his translations of and reflections upon a wide range of Indus thought. This illustration depicts his understanding of the phases of the moon. 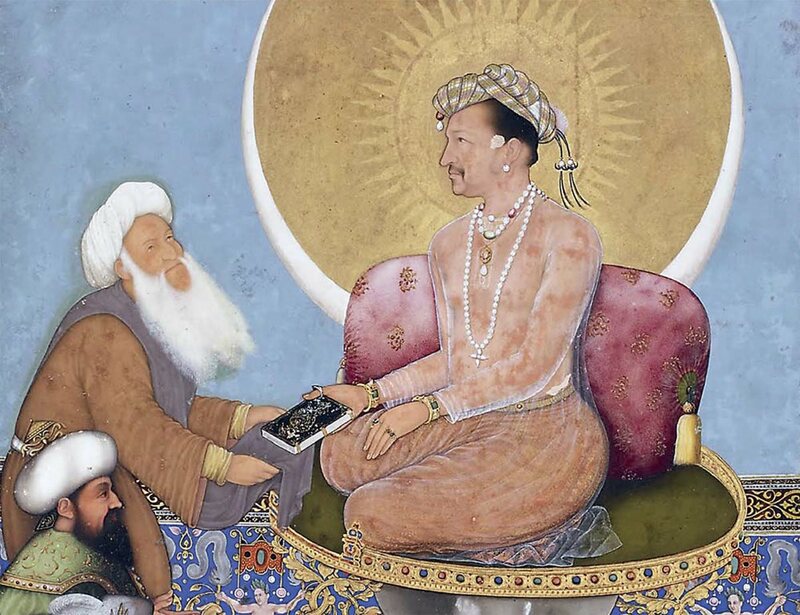 This detail from a 17th-century painting by Mughal court painter Bichtir shows one of the court’s many chroniclers, who helped the Mughal elite advance an imperial culture that included scientific concepts developed locally and afar. From the mid-10th century ce one of history's great scientific eras began to flourish across Islamic lands. He also identiﬁes crossovers between Indian sci-ence and literature, notably Kalila wa Dimna (Kalila and Dimna), a celebrated book in the Middle East since the early medieval period. Based on an earlier Indian work, Pancatantra (Five Principles), it was written down from the oral tradition in the third century BCE, and it uses animal fables (Kalila and Dimna are jackals) to tell stories about human conduct and the arts of governance. 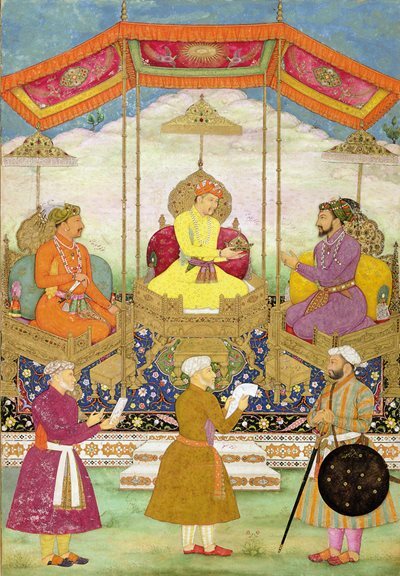 In this detail of another 17th-century painting by Bichtir, a devout Muslim practitioner receives the Qu’ran, Islam’s holy book, from a seated Jahangir, the fourth Mughal emperor. At lower left, an Ottoman sultan looks on deferentially. The hierarchy reflects not only Jahangir’s position, but also his responsibility to advance scholarship. It came to Arabic circuitously, ﬁrst via Burzuwaih (or Borzuy), a physician to ﬁfth-century CE Sassanid king Anoushiravan. Burzuwaih traveled to India to collect medicinal herbs for his monarch, and he returned with the Panca-tantra, which he translated into Pahlavi, a northwestern Persian language. After the introduction of Islam into the region, the eighth-century author and thinker Ibn al-Muqaffa translated it into Arabic and retitled it Kalila wa Dimna. So popular was the book 500 years later, the 13th-century Christian king of León and Castile, Alfonso “The Wise,” included it among works he ordered translated into Old Castilian. 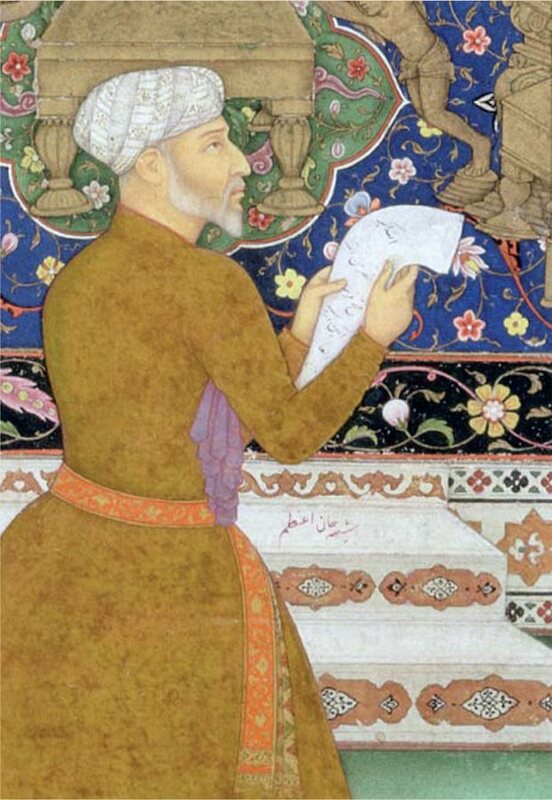 In truth, under a range of different titles—and at times with new additions and revisions—Kalila wa Dimna remained one of the most widely read works of literature in the world, popular throughout all parts of Asia as well as the Middle East, North Africa and Europe up through the 18th century. Starting a few decades after 1800, the work began to give way in the West to Aesop’s well-known Fables. Yet in India itself, as in most Muslim nations, the parables of Kalila and Dimna contin-ue to be read to teach children and adults about hu-man nature and good behavior. Most recently of all, it has been the subject of exhibitions in places as diverse as Manama, Bahrain, and Indianapolis, Indiana. Beyond philosophy and fables, Vedic texts sought to comprehend the cosmos and its workings, including creation cycles and planetary motions, thus framing some of the questions that have underpinned human scientiﬁc inquiry ever since. Modern mathematics, as we know it, would be inconceivable without the commentaries of Indian philosopher Bhaskara, who lived in the sixth and seventh centuries CE, on the Aryabhatiya, written in Sanskrit by Aryabhata, the earliest known Indian astronomer. The Aryabhatiya laid out the rotations of planetary objects as well as advanced techniques for numerating. Bhaskara’s commentaries on it represented one of the ﬁrst popular writings to employ the concept of zero, which was assigned then a symbol familiar today: a circle. The fundamental concept that void, emptiness or absence is itself an essential element of the cosmos had existed in the cul-ture of the Indus Valley from a very early period. That this should evolve into a numerical symbol thus might seem logical in a mathematical system designed to describe and predict the motions of the universe. The zero is, in fact, a “placeholder” as much as a number: It moves other numerals to the left by one place, thus increasing their magnitude by a factor of 10. Zero was thus both an idea and an actual number. 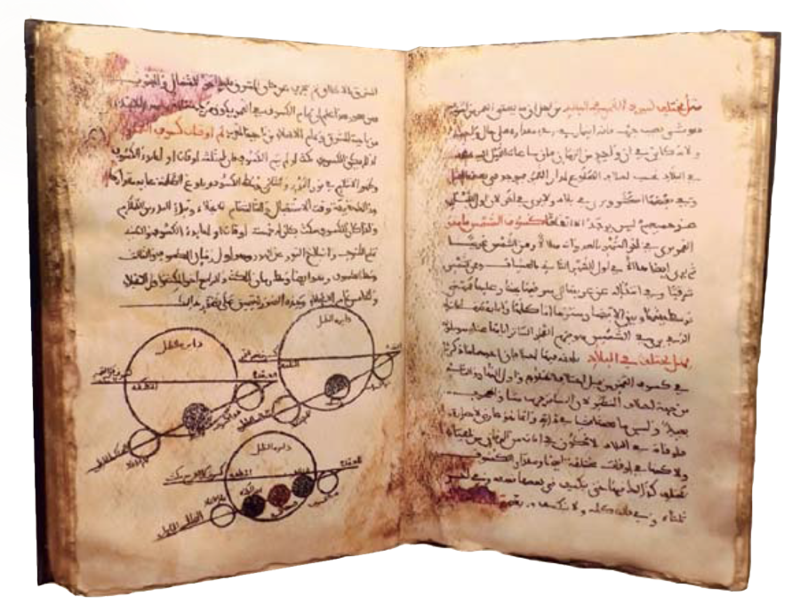 A manuscript edition of Kitab al-Qanun al-Mas'udi, a treatise on astronomy by 11th-century scientist Abu al-Rayan al-Biruni, shows the motions of planets represented as circles. Originally from Central Asia, al-Biruni traveled to the Indus Valley, and for more than 10 years he studied Sanskrit and researched the region's arts, literature and sciences, translating a number of works into Arabic. When Arab and Persian thinkers learned about zero, they transliterated its word in Sanskrit, sunya (“empty”), into a roughly corresponding Arabic sifr. In the early 1100s, when Arabic works were first translated into Latin, Adelard of Bath called it cifrae. A century after that, Fibonacci called it zephir. From there, the term became zéro in early modern French and, in English, zero. I will omit all discussion of the science of the Hindus … their subtle discoveries in the science of astronomy, discoveries which are more ingenious than those of the Greeks and the Babylonians; their valuable method of calculation; their computing that surpasses description. I wish only to say that this computation is done by means of nine signs. If those who believe, because they speak Greek, that they have reached the limits of science, they should know these things. Mislabeled for several centuries in the West as "Arabic numerals," the decimal system was conceived in India and transmitted to the Middle East even before the rise of Islam. [To teach] What is easiest and most useful in arithmetic, such as men constantly require in cases of inheritance, legacies, partition, lawsuits, and trade, and in all their dealings with one another, or where the measuring of lands, the digging of canals, geometrical computations, and other objects of various sorts and kinds are concerned. This composition served as a popular introduction to what became algebra, based on methods acquired from India, which al-Khwarizmi simplified from their original metrical (poetic) forms, writing them out in prose with explanations that have resonated ever since. The Kitab al-Jabr wa al-Muqabala, translated into Latin, made a significant impact in Europe—so much so that part of its title, al-jabr (“restoration”), became synonymous with the equation theory that we know today as algebra. The third major mathematical contribution with connections to India is the function we call sine. Ubiquitous in science and mathematics, its history transcends the boundaries of one country, one culture or one period. It appears in the Aryabhatiya as tables of half chords, trigonometric solutions equal to sine tables. In Arabic, al-Khwarizmi, through a translation of the work, introduced sine in Zij al-Sindhind, which was much copied. An 11th-century version of this book, by the mathematician, astronomer and economist Maslama al-Majriti of Córdoba, Spain, was translated into Latin during the early 12th century. This Latin rendering was brought into English in 1962 by the scholar Otto Neugebauer, and today it serves as a key resource for our understanding of al-Khwarizmi’s knowledge in astronomy and trigonometry. The Arabic term for sine, geib or jaib, represents an adapted form of the term jya (“bowstring”) used by the peoples of the Indus Valley. In truth, the Arabic word jaib came to have multiple meanings: pocket, fold or bosom. It was rendered as sinus in Latin (“pocket,” “bay”), possibly through a mistranslation, by the most prolific of all Arabic-to-Latin translators, 12th-century Italian Gerard of Cremona. By the 17th century, sinus had evolved into the abbreviated sin. Brahmagupta lived in north-central India, in Ujjain, and he set his city as the Greenwich of the ancient world by associating it with zero longitude. Brahmagupta’s work gained in popularity and influence in the Middle East, where calculating solar and lunar cycles and positions was part of workaday routines, and it was translated more than once into Arabic. Portions of it, including the use of Ujjain as a prime meridian, were adopted by al-Khwarizmi in Zij al-Sindhind, which also established the ziy tradition in Islamic astronomy. This term came from ziy, a term born out of the Pahlavi language, which connotes a thread or a cord. It referred to tables of operations that allowed astronomers to determine positions of the sun, moon, stars and planets; the time of day according to position; prayer times; and more. 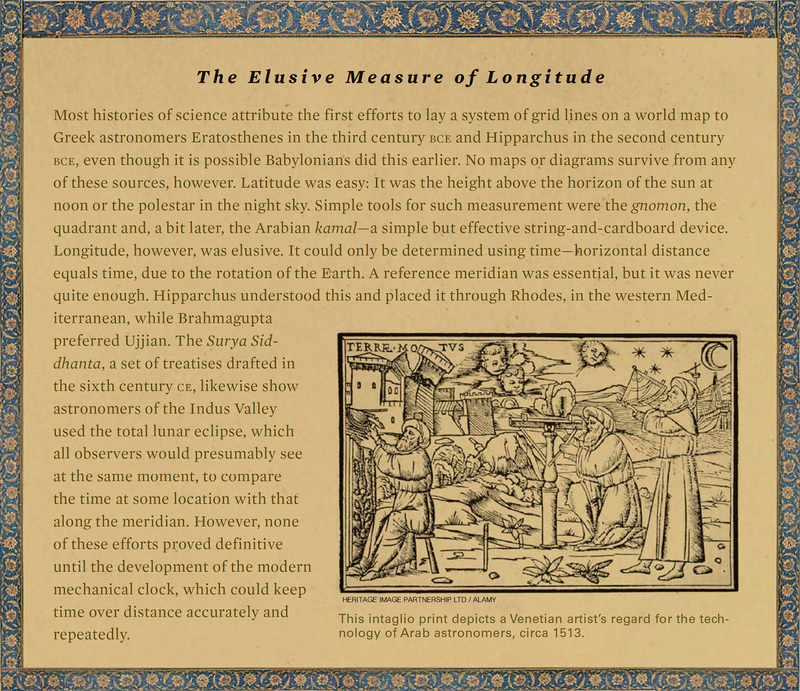 Comprising trigonometric tables, this proved superior to the Ptolemaic chord function that had been used to date by Islamic scholars in timekeeping and the deciphering of astronomical mathematics. Al-Khwarizmi could have chosen Baghdad, his place of residence, as the prime meridian. However, perhaps due to the prevalent practice in the Arabic-speaking world and al-Khwarizmi’s dependence on the Indian astronomical tables, he kept Ujjain, just like Greenwich endures as a world standard despite the fading of the British Empire in which it originated. As we know from Said al-Andalusi, it was Muhammad ibn Ibrahim al-Fazari, an eighth-century philosopher, mathematician and astronomer, who was the first person to translate into Arabic, under directives from Caliph Al-Mansur himself, Brahmagupta’s Brahmasphuta-Siddhanta, which provided mathematic evidence for calculating planetary epicycles and their positions, and even diameters of the Earth, sun and moon, beyond the Indus Valley. Al-Khwarizmi later summarized this work in Zij al-Sindhind, which remained an important reference work in Europe during the medieval period, including, for example, for the Castilian texts Toledo Tables and the Alfonsine Tables. Indian medical texts and ideas also had potent influence in Islamic scientific circles. Al-Tabari, an early ninth-century scholar from Tabaristan along the southern shore of the Caspian Sea who later served as physician and counselor to Caliph al-Mutawakkil in Baghdad, wrote an encyclopedic book on medicine, Firdaws al-Hikmah (Paradise of Wisdom). This book contains some 36 chapters and refers to the works of noted Indian physicians such as Caraka, Susruta, Madhavakara and Vagbhata II. Al-Tabari devoted much space to Ayurvedic medicine, a science born of early Indus Valley civilizations and recorded in Sanskrit literature. Al-Biruni’s thoughts on medicine, likewise, wereinfluenced by Indian tradition. In his works, we find mention of the availability of an Arabic translation of Caraka-Samhita, a medical text first written in Sanskrit before the second century CE. A century before Al-Biruni, Al-Kindi from Baghdad wrote a medical formulary called Aqrabadhin (Pharmacology), an English translation of which was published by Martin Levey, an American professor of Semitic languages, chemistry and mathematics. According to Levey, about 13 percent of the book originates from the Indus Valley. In his view, however, “many of the Persian materia medica may more properly be considered to be Indian,” thus suggesting that as much as a third of the plants and drugs described originally came from India. In all these fields of knowledge and inquiry, then, we find deeper interconnec- tions among the scientific culture that developed in Islamic lands and India than are often discussed in (mostly Western) histories of science. This kind and degree of connection, we should note, is not unique to the advances of Islamic science. It is much of the story of how knowledge itself has advanced through regional and global processes of contact and communication—processes that advance at their most rapid pace ever today. Coauthor of A History of Science in World Cultures: Voices of Knowledge (Routledge, 2015), from which article was adapted, Kumar is a Distinguished Teaching Professor of physics at the State University of New York, Oswego. Coauthor of A History of Science in World Cultures: Voices of Knowledge (Routledge, 2015), from which article was adapted, Montgomery is a geoscientist, lecturer and affiliate faculty member at the Henry M. Jackson School of International Studies at the University of Washington, as well as author and coauthor of 10 books, three of them on the history of science.